Since his retirement as Chief Justice of the Nevada Supreme Court in 1997, Thomas L. Steffen has been a vital member of the firm serving as Of Counsel for Hutchison & Steffen. Thomas’ career started in 1961 when he, along with his family, moved to Washington, D.C., to attend law school at George Washington University. While attending law school, Tom worked full time as a contracts negotiator for the Bureau of Naval Weapons. Tom managed to be on the Board of Editors, George Washington Law Review, 1963-1964, published a major article and a case note, and graduated from the law school with honors in 1964. During his almost 15 years on the Court, Tom especially enjoyed the opportunity to earn an LL.M degree in the judicial process from the University of Virginia in 1988. 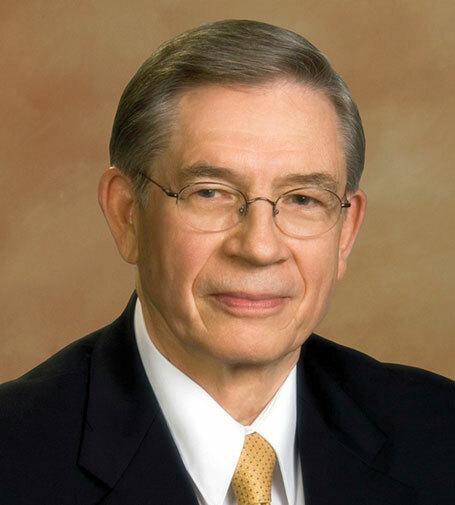 For 17 years Tom enjoyed a successful and varied civil trial practice in the state and federal courts before his appointment to the Supreme Court in 1982. Although Tom specialized in representing builders and developers against lenders for several years prior to leaving the practice of law for the Court, he also enjoyed practicing in areas of medical malpractice, personal injury, and intentional tort law. Tom is sufficiently honest to admit that his wife is responsible for at least 60 percent of any good he has accomplished in life, and that it is a joy to end up working for his youngest son, John, and his close and capable friend, Mark Hutchison. Tom’s greatest enjoyment comes from his family, including his wife, five children, and eighteen grandchildren, BYU football, and work. Chairman, Nevada Judicial Council, 1995-96; Nevada State-Federal Judicial Council, 1985-94, Chairman 1986-91. Vice Chairman, Nevada State Judicial Education Council, 1983-84; Chairman, Nevada Code of Judicial Conduct Study Committee, 1990-91. Executive Committee, Board of Visitors J. Reuben Clark Law School, Brigham Young University, 1984-86, Chairman, 1987-89. Former director, Nevada Trial Lawyers Association; Former Chairman of Medical/Legal Screening Panel for Southern Nevada. Master, American Inns of Court, Bruce R. Thompson chapter, 1988-96. Robert Houghwout Jackson Lecturer, National Judicial College, July 28, 1995. Honorable Tom C. Clark Lecturer, American Judges Association, November 1984; Recipient, 1983 Merit Citation, Utah State University. Chief Justice, Associate Justice, Nevada Supreme Court 1982-1997. LLM, University of Virginia 1988. J.D. with honors, George Washington School of Law, 1964. Board of Editors, George Washington Law Review, 1963-64.